This spread showcases two different experiences at Universal Studios – Skull Island Ride and the Mythos Restaurant. I didn’t really have enough pictures from either event to create a full spread and so I put them side by side, and used one element to tie them together. If you look closely (you may have to click on the picture to enlarge it) – the left and right hand borders have the same leaf pattern sewn into them. I did this using my sewing machine. And, the left hand border has the same paper that I used to border the pictures on the right hand page. 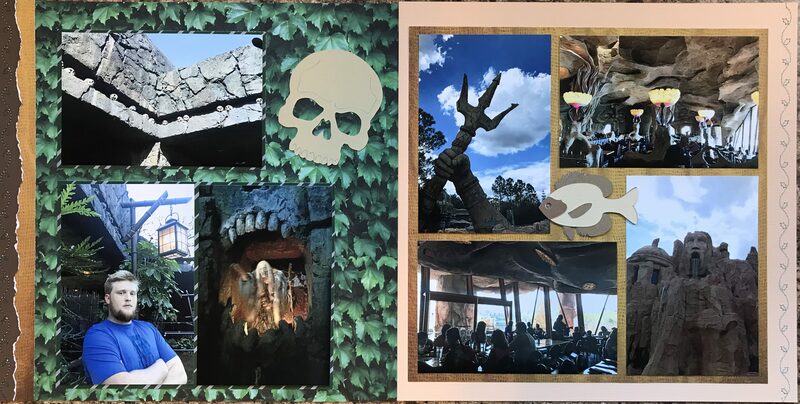 For the left hand page I chose a leaf background to tie in with the jungle theme of the ride, and used my Cricut machine to cut out the skull. If you look closely at the borders on the pictures on this paper you will see that it is green striped. This is actually Slytherin background paper from a Harry Potter paper set. I thought it was fun to use this here as our main reason for the trip was to visit the Harry Potter areas at the parks. The leaf border on this page is meant to evoke images of vines hanging in the forest. The right hand page is of our experience at the Mythos restaurant which serves amazing food in an incredible under the sea setting. If you want to eat here I encourage you to make reservations way in advance, or eat at an off-peak food time. I bordered the pictures with a textured background to resemble fish skin, and used my Cricut machine to cut out the fish that is in the middle of the pictures. The leaf pattern on the border on this page, even though it is exactly the same as on the left border, here brings the image of seaweed.